What pictures come to mind when someone mentions Italy: a gondola in Venice; the Leaning Tower in Pisa; the Coliseum in Rome? Do you smell the pasta gravy cooking? Ahh, the vino. I had a charming lunch in this cozy, little spot. Few countries have as much to offer as Italy (Italia), with its warm and passionate people; varied and beautiful landscape; a rich, artistic, historic and cultural heritage; some of the world’s best food and wine; and a stylish and relaxed philosophy on life, one that is instantly apparent to foreigners. Life is for living, for enjoying, for savoring. There’s always time to chat, time for kindness, time to laugh; passions run high but anger is quickly over and forgotten. Watch the way Italians treat children and the elderly, without condescension but with respect for their age. Italians spend much time and thought on looking good, and appreciate it if tourists do it as well. Dressing appropriately means no shorts in cities. If you show too much arm or leg, you won’t be allowed to enter churches. Major cities become packed during the hot summer. Get out early to avoid the main rush or visit in late fall or winter when its quieter and cooler. Plan your time around siesta from 12:30 until 4:30 since everything closes for several hours. There are few department stores and virtually no malls, so enjoy shopping in little local stores or colorful street markets. 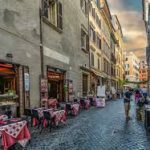 Rome (Roma): There’s almost too much to do in Rome and it would take months so it’s important to plan your time wisely. Decide where your priorities lie. Plan ahead or you may spend precious hours standing in long lines. Tackle the highlights early in the day. The site of the famous Trevi Fountain has had a fountain there since Roman days. Throw two coins in the fountain before you leave Rome; the first grants a wish and the second guarantees your return. St. Peter’s Basilica is architectural grandeur on a triumphant scale; the sublime Pieta is housed here. Vatican City covers 109 acres around the Basilica. The Pope gives a general audience weekly on Wednesdays at 11:00am. Its open to everyone and tickets are free. The massive Colosseum, which seats 55,000 and can be cleared in 20 minutes, dates from 72 AD. The arena can even be flooded. 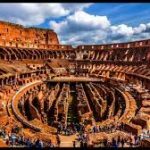 During the Middle Ages, the Colosseum was an excellent source of building stone, which explains the missing sections. In the photo, the “floor” of the colesseum is missing and you can see the pathways through which underground traffic, such as lions, moved! 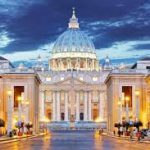 The Vatican Museums make up the world’s largest museum complex; it would take days to see everything so follow one of the color coded routes or pick out highlights that appeal to you. If you want to see the Sistine Chapel, again, plan ahead or wait in lines for hours. The Pantheon, built around 120 AD is still in use today. Built as a temple, it became a Christian Church in 609 AD and now houses Raphael’s tomb. 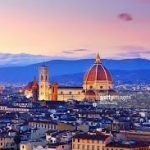 Florence (Firenze): Visitors come with expectations of beauty, stunning art, history and stylish people; sadly heat, crowds, noise and cultural overload often overwhelm them. Planning pays off. Don’t plan to use Florence as a base for touring the rest of Tuscany. Most museums open at 8:30am and the churches even earlier. Remember siesta time. Holy Cross (Santa Croce) church is the burial place for Michelangelo, Machiavelli and Galileo and a must-see. The Academy Gallery houses the world’s most important collection of Michelangelo’s sculptures. The Office Gallery is home to paintings by Botticelli, Leonardo da Vinci, Raphael, Michelangelo and more. Come early. Naples (Napoli): Naples is best tackled by bus, cable car and on foot. A visit to the ruins of Pompeii, buried in volcanic ash in 79 AD for 1700 years, is a must! Consider an excursion to the Isle of Capri, if the humidity isn’t too bad. Seeing the cave of the Blue Grotto, a spectacular sea cave filled with reflective turquoise, is incredible, if the tide is right! You can only get into the cave in low tide! Pisa: The pictures are so beautiful, intriguing, filled with mystery…but quite honestly, a picture is worth a thousand words. Visiting Pisa itself is a disappointment. Located in a very poor part of town, you are surrounded by beggars trying to sell their wares. Enjoy the pictures, skip Pisa. 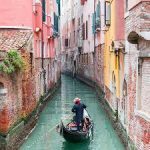 Venice (Venezia): Of course you want to ride in a gondola; be sure to know the route before you go. By day, its like being in a taxi in the city; by night, you’ll see women tossing pasta in their kitchens and experience the romance of Venice. The Murano Glass Factory is a sensational spot for a special souvenir of glass, marbled paper, special masks or velvet slippers. The House of Gold (Ca’ d’Oro) is so called because it was once gilded and is a fine example of Venetian-Byzantine architecture. Another fusion of styles is the Basilica of St. Mark. If you sit in St Mark’s Square expect to pay for the seat! Ordering simple burgers and cokes will cost over $30 for two. 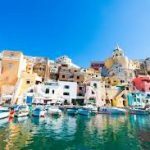 Of all the European countries, Italy is the one to which travelers return time and again, their love affair blossoming with each trip. Italy truly has something for everyone, whether the visitor is seeking great cities, tiny villages, idyllic countryside or beautiful beaches. Whether your visit is a chance opportunity or the dream of a lifetime, Italy will fulfill and exceed your expectations, capture your heart and senses, and send you away longing to return. Picture credits: erasmusu, funfoodtravel, roman-gateway.com., winterline, gettyimages.com.